It's been a while since I've sat down to write a blog post. The reason is that I have way too much to say. I don't know where to start. So I'm just going to start wherever. A while back I went to a writing and illustration conference. I was not in a great frame of mind at the time. Let me take this moment to state that I am a very up and down person. I have a tendency to either feel extremely hopeful, like anything is possible, or to feel like almost nothing is possible, like crossing the room to get a glass of water may take too much energy. I'm not exaggerating at all here. So, at the time I went to the writing and illustration conference I was in the “It's hard to get a glass of water” frame of mind. In retrospect it would have been a great idea to stay home. For me, sometimes community is a bad thing and isolation is healing. Yeah, I know—I've never heard anyone say this. I'm going to take a break from this story to tell you something else. I hear people say that community is good and that isolation is bad. By community they usually mean interacting with a group of people—maybe a Sunday school class or church group, a neighborhood cookout, a community dinner, a cocktail party, a book club, or a writing and illustration conference…For me, sometimes community is a bad thing and isolation is healing. Yeah, I know—I've never heard anyone say this. But listen, if I'm feeling really low and I can tell that my thoughts are altogether a little off kilter, the last thing I should do is insert myself into “community”. I have tested this theory at least a thousand times. I have gone to the social function in the name of "community is good and isolation is bad" and guess what? It does NOT go well. It isn't enjoyable (for anyone involved). It isn't helpful. I like to get my head straight BEFORE entering into that kind of community. And I get my head straight by means of isolation—going for walks and praying, and talking to my very oldest, dearest friends, on the phone (but not all at once because that would be weird and awkward). So…sometimes, community is bad and isolation is good. Back to the writing and illustration conference. To say I walked into this in a low, sad state of mind really doesn't do it justice. So, it won't surprise you when I say it didn't go well. It occurs to me that this is going to be a very long story. So for now I'm going to leave you with this little illustration of how I was feeling heading into community on the day I should have stayed home. Disclaimer: The writing and illustration conference itself was a really great thing—well organized by thoughtful people, full of helpful information. But when a person in a bad frame of mind (in this case me) walks into a good thing, it is a bad thing. I've drawn a few little illustrations of this point. 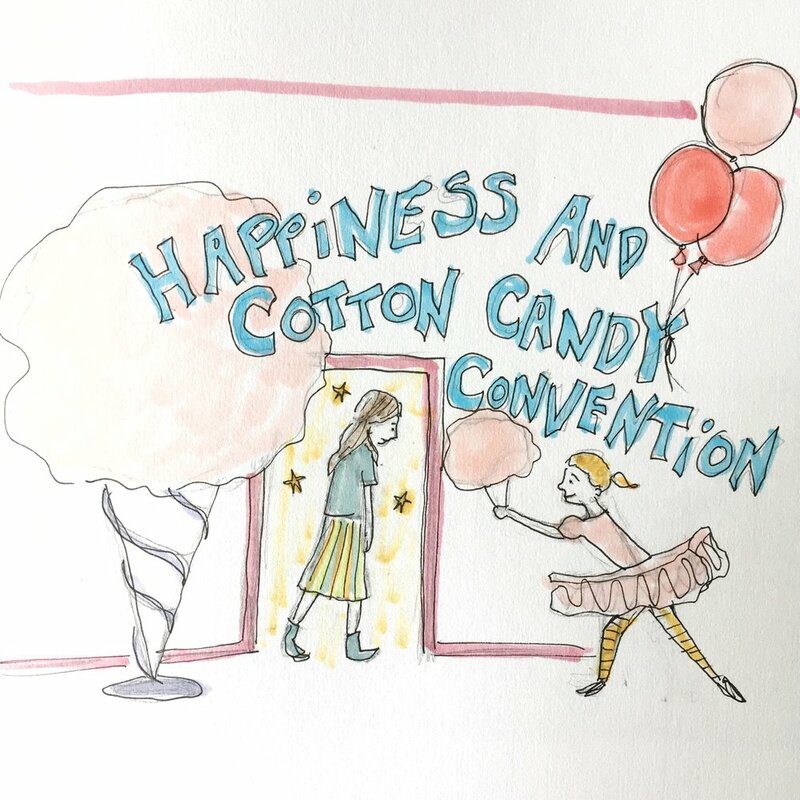 One is of me, in a rotten frame of mind, walking into a Happiness/Cotton Candy Convention. One is of me walking into a Fantastic Hats Shop, and one (just for kicks) is me walking into Narnia. You can tell that even in the Narnia scenario, things just weren't going to go well.